Tsckling the issues surrounding today's supply chains requires the best in optimization, engineering, economics, and business management. 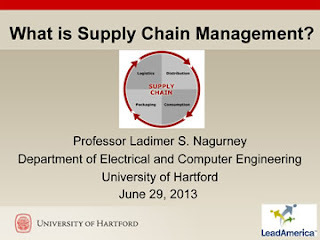 Supply chains are fascinating and to appropriately model and analyze them requires a holistic, system perspective. Yesterday, my husband, the other Professor Nagurney, spoke to a group of 200 high school students at the Olin College of Engineering in Needham, Massachusetts. 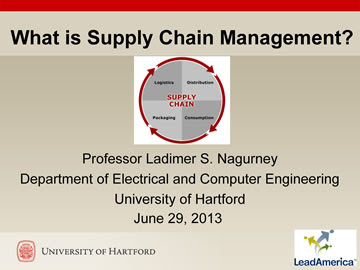 His presentation was entitled: What is Supply Chain Management? 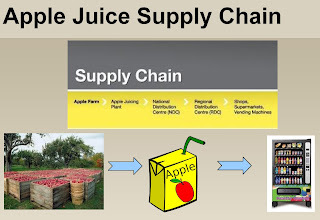 He presented numerous applications so that the high school students would appreciate the various aspects of supply chain management from sourcing to outsourcing and even corporate social responsibility and environmental awareness. He also spoke about conflict minerals. 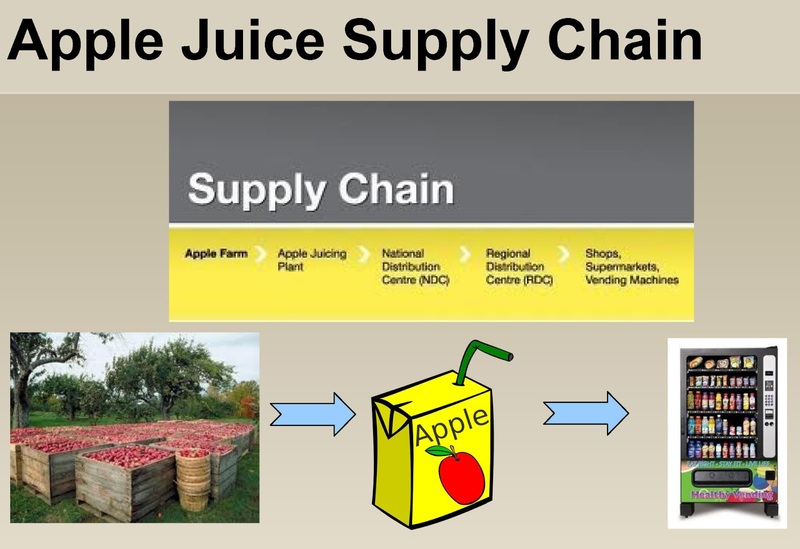 The high schoolers could very much relate to the apple juice supply chain and remembered drinking from juice boxes as toddlers and in elementary school. They also appreciated the forestry supply chain, the pharmaceutical supply chain, which we have done a lot of writing on. One very observant student notices that, except for the tail fin, parts for the Boeing 787 come from outside the state of Washington. 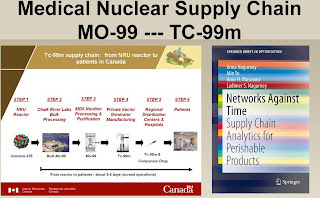 He also spoke on the medical nuclear supply chain, noted immediately above, which is a supply chain network that we have written about and which, in our mathematical models, we utilize also physics to capture the decay of medical radioisotopes over space and time. 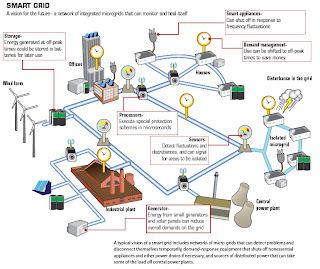 He also noted that smart grids are supply chains. 1. How do you decide whether to outsource or not? 2. Does anything matter besides price of a product? 3. What happens to the supply chain when a supplier goes out of business? Remember, the audience consisted of high school students! The students appreciated the system perspective and the engineering and business issues. 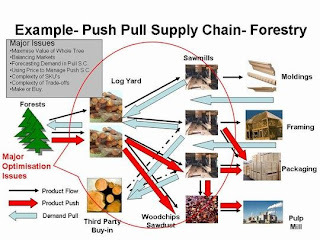 Through supply chains, one gets to appreciate the distinct paths that products take. For those who are interested, the full presentation can be downloaded from the Supernetwork Center website. And for our latest research on supply chain networks with applications to food, healthcare, fast fashion, and even electric power, please visit our Supernetwork Center publication page. I returned last week from Europe, where I have been spending part of my sabbatical as a Visiting Professor of Operations Management at the School of Business, Economics and Law at the University of Gothenburg in Sweden. This sabbatical has been fabulous and I am now writing several research papers, inspired by my time in Europe and discussions with colleagues in Sweden. The Euro INFORMS Conference will be taking place soon -- July 1-4, 2013, in Rome, Italy, and I am pleased to report that several Supernetwork Center Associates will be taking part and that they represent 4 different countries! It is wonderful to see so many operations researchers and management scientists converging from around the globe for this conference! Although I won't be going to Euro INFORMS, our research group will be well-represented there. Being the Director of the Virtual Center for Supernetworks, which I founded in 2001, has been incredibly rewarding and I am very pleased that we have sustained its richness of activities in terms of research, education, and outreach and that our website gets visited every day internationally. We have built a community of Supernetwork Center Associates, many of whom received their PhDs from the Isenberg School of Management at UMass Amherst, that collaborates and supports one another. Conferences are the perfect venues in which to reconnect face to face and the Euro INFORMS Conference will be bringing together Center Associates: Professor Patrizia Daniele of the Department of Mathematics and Computer Science at the University of Catania in Italy, Professor Dmytro Matsypura of the School of Business at the University of Sydney in Australia, Professor Tina Wakolbinger of the Vienna University of Economics and Business, and Professor Jose M. Cruz of the School of Business at the University of Connecticut. Patrizia Daniele has organized a session on Recent Advances in Dynamics of Variational Inequalities I and will be speaking on: Variational Inequalities and Applications to Network Models in session II. In the latter, Tina Wakolbinger and Jose Cruz will deliver their joint paper: Applications of Variational Inequalities in Supply Chain Management — Status Quo and Future Directions. Finally, Dmytro Matsypura will present on: Incremental Network Design with Maximum Flows. His paper is joint work with Martin Savelsbergh and Thomas Kalinowski. And, since I could not resist, below are photos of several of the Center Associates with me, when Professor Daniele and her husband visited the Supernetwork Laboratory for Computation and Visualization at the Isenberg School at UMass Amherst, back in the summer of 2004, July 9-10. In the photo immediately above, Tina Wakolbinger is the second one from the left, and Jose Cruz is standing behind me (I'm in the flowered dress). Dmytro Matsypura is behind Patrizia, who is also next to me. It is wonderful to see the academic social network flourishing! I was delighted to see that the latest round of Presidential Innovation Fellows announced recently by the White House includes not only our very own Dr. Bev Woolf, of the Computer Science Department at UMass Amherst, but also two Fellows in Disaster Response & Recovery and also two in Cyber-Physical Systems in the list of 43 new Fellows. Cyber-Physical Systems," will be presented on July 8, 2013, in the opening session, following the keynote, at The Third International Workshop on Cyber-Physical Networking Systems, in Philadelphia. In our paper, we acknowledge support from the National Science Foundation on our project: Network Innovation Through Choice. As we state in our paper: Cyber-Physical Systems (CPS) promise to provide technical solutions to solve some of the most important societal and environmental problems. By combining sensing and response actions in the physical domain with processing and communication functionality in the computational domain, CPS can provide novel solutions in the areas of health care, transportation, energy, disaster response, manufacturing, defense, etc. It can be expected that cyber-physical systems will become ubiquitously deployed in the coming decade as users demand more “smart” solutions in their environment. Traditionally, cyber-physical systems have been considered to be tightly integrated solutions that are aimed at specific application domains. Typical examples include industrial control, flight control in airplanes, agriculture, etc. These traditional application domains of CPS are often characterized by safety concerns and tight performance constraints. In parallel, a broader view of cyber-physical systems has emerged, often termed distributed cyber-physical systems (DCPS) orthe “Internet of Things,” where interacting components are more loosely coupled and real-time constraints and safety concerns are less dominating. Application domains from this space include home automation (e.g., lighting and temperature control), smart appliances (e.g., operation based on energy availability and price), smart traffic control, etc. In our paper, we argue that in order to develop a common infrastructure for a large-scale DCPS, it is critical to develop a framework that allows for horizontal integration of CPS components. We discuss the vision, requirements, and design of such a framework. We present several specific technical challenges that need to be addressed in this context as well as potential solution approaches. We also provide examples to illustrate how our framework can lead to innovative new uses, from weather sensing to smart transportation, that can have meaningful impact on practical problems. I made it back from Gothenburg, Sweden via Amsterdam to Boston Logan yesterday evening, after spending 5 weeks in Europe. Already I am missing Swedish coffee and cakes and the people in Sweden! There were several folks from Amherst on my flight from Amsterdam to Boston, including Dr. John Dubach, the UMass Amherst CIO (Chief Information Officer). Plus, in the seats in front of me, there was Dr. Suresh Nair from UConn's School of Business and his wife. He is in the Department of Operations and Information Management. It is rare that I don't see someone I know on a flight or at an airport. Having had a chance to take part in Midsummer (summer solstice) activities this past weekend in Sweden was special. And there I ran into Dr. Robin Biddulph of the School of Business, Economics and Law, who has organized our wonderful Visiting Professor Program lunches and get-togethers! Most of the city, otherwise, was eerily quiet. The clouds parted long enough for the Midsummer festivities in Schlottskogen, the gorgeous park in Gothenburg, to take place. The photos below are from the special event. Happy Summer to all those north of the equator! 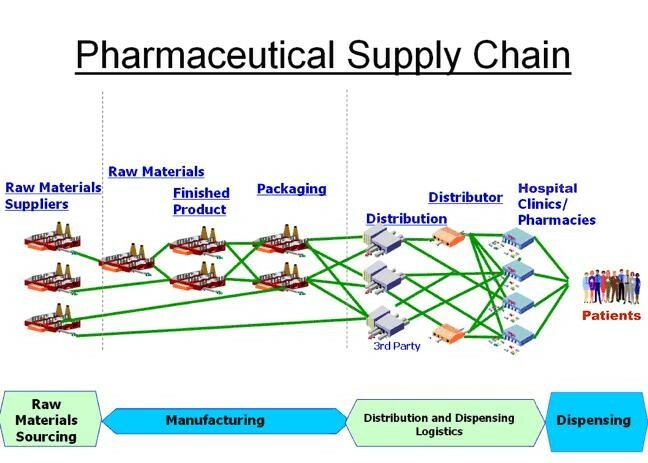 With the 2013 INFORMS Healthcare Conference in full swing in Chicago, I thought it appropriate to highlight some recent research on quality competition and the outsourcing of the production of pharmaceuticals (medicines). Medicines are essential to healing and, hence, their quality is paramount to health. 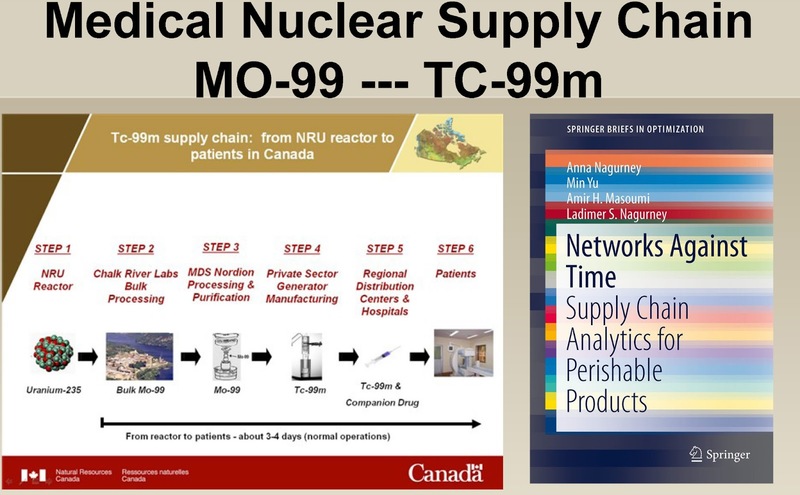 I have written on healthcare supply chains on this blog on multiple occasions from the broken humanitarian healthcare supply chain to medical nuclear supply chains to advanced analytics for pharmaceutical supply chains. Our book, Networks Against Time: Supply Chain Analytics for Perishable Products, published by Springer in 2013, contains several chapters focused on healthcare supply chains. And, my most recent PhD student at the Isenberg School of Management, in Management Science, Amir H. Masoumi, successfully defended his dissertation entitled Supply Chain Management of Perishable Products with Applications to Healthcare, so clearly there is also great interest in healthcare applications among our students. 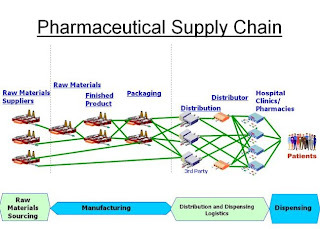 My interest in healthcare supply chains, grew in part, because of the work with Amir, beginning with blood supply chains, which was a special interest of his. Professor Hari Balasubramanian, who is the Program Chair of the 2013 INFORMS Healthcare Conference, was on Amir's doctoral dissertation committee. Most recently, we have been researching quality competition, beginning with the paper, A Dynamic Network Oligopoly Model with Transportation Costs, Product Differentiation, and Quality Competition, Anna Nagurney and Dong Li, which is in press in the journal, Computational Economics. Given the importance of healthcare and pharmaceuticals, as well as the growth in the outsourcing of pharma production globally, along with numerous issues raised in terms of quality, it was important to investigate how math modeling could contribute to issues of quality, reputation, outsourcing, and competition. Anna Nagurney, Dong Li, and Ladimer S. Nagurney, is now in press in the journal, International Transactions in Operational Research. This paper quantifies the effects of quality levels on a firm's reputation and develops a game theory model of outsourcing for a pharmaceutical firm. We developed both a static version (at the equilibrium state) and a dynamic version to illustrate how the quantity and quality levels evolve over time. We utilized variational inequality theory for the former and projected dynamical systems for the latter. Math modeling, operations research (O.R. ), and analytics are contributing tremendously to the understanding of healthcare issues in our society. Doing Good with Good O.R. continues as a theme of our profession. Thanks for a Great Visiting Professorship Program! All good things must come to an end and I am starting to pack up since soon I will be heading back to the US from Sweden. This has been my fifth stay in Gothenburg, Sweden, at the School of Business, Economics and Law at the University of Gothenburg and my experiences as a Visiting Professor here have been fabulous. I would like to thank the staff, my colleagues, and the students for making me feel so welcome during my sabbatical from the Isenberg School of Management at the University of Massachusetts Amherst. As I stated in my recent commencement speech, this has become my second home! Thank you for the wonderful lunches, conversations, visits to your homes, research discussions, much laughter, conferences, additional lectures, and more! The research collaborations will continue across the miles. The memories will always be part of me. Many thanks to the sponsors of the Visiting Professor Program for seeing the importance of university and corporate relationships and internationalization. I do a lot of traveling, especially flying, as part of my roles as a Professor and a Speaker. I have also lived outside of the US, due to Fulbrights and Visiting Professorships (and was born in Canada). These experiences have been some of the richest and most rewarding ones in my career and life. Having lived in Innsbruck, Austria (on a Fulbright) with views of the Alps, as well as in Stockholm, Sweden and, now, in Gothenburg, Sweden, travel and living abroad stimulate ideas, enhance experiences that you can share with students, and provide you with cultural richness that you can't obtain by just staying in one place, no matter how comfortable you are. I have also spent time in Italy as a Fulbrighter. This past week, I wrote about speaking in Athens, Greece and in Gothenburg, Sweden and last night my family made it back to Amherst, Massachusetts after two legs of flying and a drive from Boston. This morning, while checking the news in my office in Sweden, I was shocked to see that James Gandolfini, who starred as Tony Soprano, in the award-winning series, Sopranos, died at age 51 while on holiday in Rome, Italy. The fabulous mayor of Boston, Thomas Menino, was taken ill last Fall, while on a short vacation in Italy, and has endured multiple health issues since. Last week, I was shocked to hear that Dr. Jesus Artalejo, the Editor of TOP, an operations research journal, had died (a heart attack is being suspected), while at a conference in Arizona. There are other examples of colleagues that have also passed away while at a conference in another country. 1. Try and practice social distancing from those who are coughing heavily or are like typhoid Mary -- this has been harder to do on packed flights. If all else fails, put on your face mask -- I have done this twice and it worked. I have also spent a lot of time in the back of planes on long flights where I have met some of the most fascinating people! Especially now with the MERS virus it is important to not pick up dangerous infections (remember SARS?). 2. Wash your hands often and use your hand sanitizer during travel and at your destination. 3. Exercise, exercise, exercise -- walking through airports and at your destination will help you to overcome jetlag and will go a long way in keeping you fit and healthy. I rarely sit at an airport -- we do enough of that on transoceanic flights. 4. Drink a lot of water every day. 5. Eat healthy, nutritious food and enjoy cuisines from around the world but pay attention to food safety. 6. And, if possible, get enough sleep -- sleep needs vary from person to person. 9. Make sure that you have the necessary vaccinations for the country that you are traveling to. 10. Ejoy the experiences while traveling and pace yourself appropriately! More advice for health and travel can be found here. Many of my colleagues will be heading to the EURO Conference on Operations Research in Rome, Italy, so do take care of yourselves, wherever your travels may take you! My husband, who has a PhD in physics, told me the sad news today that the Nobel laureate in physics, Dr. Kenneth G. Wilson, has died. I remember him so fondly, since in the late 1980s and early 1990s, I was heavily involved in supercomputing and parallel processing and utilized the Cornell National Supercomputer Facility, which Dr. Wilson led. I had heard hi speak on several occasions and enjoyed his vision very much. I also served for several years on the National Allocation Committee for time at this supercomputer facility, which utilized primarily IBM computers. My work there blended computational economics with operations research and many applications to spatial economics. I would fly to Ithaca several times a year and always enjoyed my time there. In addition, IBM at that time would host outstanding short workshops on various themes in idyllic Lech, Austria and I spoke both at the Computational Economics one there and at the Computational Finance one and recall even seeing Dr. Alan King of OR/MS fame at one of them. After Dr. Wilson's extended time at Cornell he then joined the faculty at Ohio State University. He enjoyed hiking especially in the Dolomites, the Swiss Alps, and in New Zealand and he got many of his ideas while hiking. I do as well. Rest in Peace, Dr. Wilson -- you will be missed. An obituary on Professor Wilson is here. 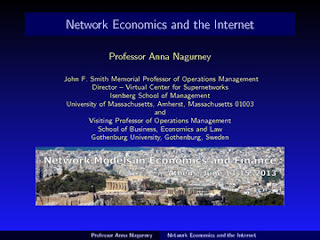 In my previous post I wrote about the Network Models in Economics and Finance Conference that I had the pleasure of giving a plenary talk at last Friday in Athens, Greece and I also posted some conference photos. I am now back in Gothenburg, Sweden but, thought that I would share with you some of the majesty of the antiquities in Athens. Prior to our flight(s) yesterday we managed to climb up to the Acropolis and the Parthenon. Coincidentally, last Sunday, one of my former doctoral students, who is now a very successful financier, welcomed us to a christening and we enjoyed both the rituals as well as the reception that followed very much. Given all the negative comments being written about Greece lately, I thought that I would emphasize its beauty and amazing cultural history through the above photos. On Thursday, I was flying from Gothenburg, Sweden to Athens, Greece via Amsterdam. In Amsterdam, our flight was delayed, due to the strike of the air traffic controllers in Athens. The KLM pilot ultimately decided to forge on since he had heard that the strike would be over about the same time as we were to land but we had extra fuel in case we had to circle. Our plane was about the 10th one to land that afternoon. I was coming to Athens to take part in the Network Models in Economics and Finance Conference at which I was to give a plenary talk, which I did yesterday, despite the fact that the university (National Technical University of Athens) was also on strike. My presentation was on Network Economics and the Internet. The conference was wonderful although I missed the first day because I had to give a commencement speech in Sweden, There were speakers from Greece, Italy, Russia, and the US and it was nice to be at a conference with just single sessions (no parallel ones). Speakers were from operations research / management science, computer science, economics, mathematics, and finance. Lunch and snacks were provided. Last night, we had the conference banquet at the new Acropolis Museum with a view of the Acropolis and the Parthenon. We watched as the sun set to see the Acropolis then lit up in all its glory. This was an unforgettable evening in which we talked about mathematics and creativity, research, and friendships -- absolutely fabulous. I thank the organizers: Professors Panos M. Pardalos, Valeriy Kalyagin, and Themosticles Rassias for a conference that we will never forget! This is my third trip to Athens (always involving conferences) and it is undoubtedly the best! Today, I had the great privilege and honor of delivering the commencement speech at the diploma ceremony in honor of the recipients of the Master's degrees at the School of Business, Economics and Law at the University of Gothenburg in Sweden. There were a total of 105 graduates, ranging from Accounting, Finance, International Business and Trade to Economics and Transport and Logistics Management. The theme of my speech was On Great Leadership. In my speech, I emphasized the importance of innovation and creation, doing the right thing, making opportunities for others, recognizing the achievements of others, supporting diversity, and remembering where you come from. I also noted that Great Leaders must be resilient, need to be great communicators, both in word and action, and keep their integrity. I highlighted both Swedish and US innovators and great leaders. 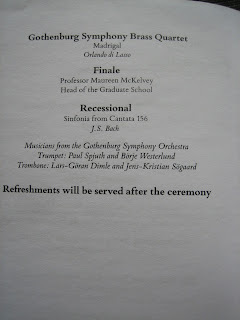 The full text of my commencement speech can be downloaded here. 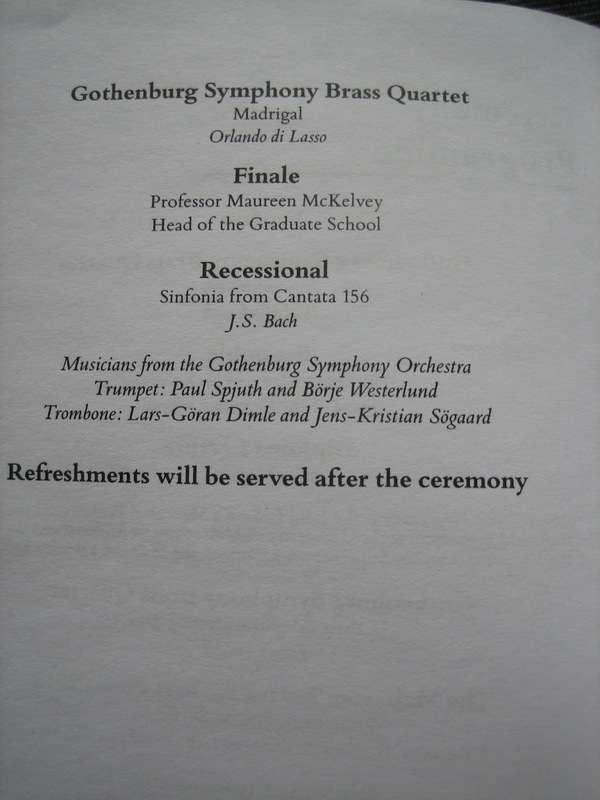 The program of the ceremony is below. The venue was a majestic University of Gothenberg building on Vasagaten. The photos below were taken at this very special event. Congratulations to all the graduates -- I wish you all well on the new stage in your life's journeys! Thank you for the great honor and opportunity to speak to you today. Special thanks go to Dr. Maureen McKelvey, who is stepping down as the Dean of the Graduate School, and who has done so much for the school over the past 5 and a half years. Also, special thanks to Dr. Johan Malmsten, the Chair of the Board of the Malmsten Foundation, for the great support of the school, its programs, and its students. Today, he awarded checks of 10,000 kroner to each recipient of the best Master's thesis in a concentration. The Financial Times, weekend edition, had a marvelous article on the rebirth of the US city and the future, which I read last evening in Gothenburg, Sweden. The article focused on Detroit and how changes in transportation -- an addition of a street car line, first since the 1950s, the oldest farmers market in the US, which is still there, and how some citizens and entrepreneurs are bringing this city back. Detroit also is attracting talent and youth, who realize that the serendipity of a vibrant city creates opportunities, chance meetings, novel forms of entertainment, and, with safety and mobility, can provide a much richer and stimulating life than that in the suburbs. The article also noted the city of San Bernadino in California where the journalist was advised that it was not safe to walk alone either in the daytime or at night and where even the poor are completely car-dependent. As a lady quoted from Tampa, Florida stated, when you scream for help in a city someone will hear you -- but in the suburbs it is a different story. Well-functioning, convenient, reliable, comfortable and pleasant transportation systems are essential to the future of our cities. This being my fifth time stay in Gothenburg, for multiple weeks, since the beginning of 2012, I have come to enjoy the different modes of transportation and every day marvel at the bicyclists of all ages that pump up the hills of the Chalmers University of Technology area, where I now have an apartment. The trams (streetcars) have different fare tickets that one can purchase and tickets can be used for different modes of transport including the trains and ferries plus busses. And, of course, the city's bike share program is a success whereas the NYC one, which is only a few weeks old, has quite a few kinks in it with equity issues raised as well. Gothenburg (sometimes spelled Goteborg), also has pedestrian walkways and bikeways, many of which are side by side. Below I feature some of the transport options, which add so much to the mobility of the people here, the city's vibrancy and energy. Plus the trams and trains and busses and ferries are such a pleasure to ride! As for our physical fitness, every day I also walk for miles as part of just living in this great city. US cities can learn a lot from Sweden. The above photo is of a vehicle transporting the share bikes to points where they can then be used by bicyclists.